Welcome to Rhythm-In-Music.com, an interactive educational site that will help you expand your musical knowledge and improve your skills. The site includes clear and thorough definitions, and it answers the question, “what is rhythm?” by explaining beat, tempo, meter, time signature, note values, and every fundamental aspect of rhythm. The table of contents lists all of the educational material on the site. This site is useful for many different people: students who need information to help them learn the fundamentals of music, serious musicians who want to improve their rhythm skills or sight-reading ability, and teachers who are looking for free exercises for their students. To understand rhythm you need accurate Information, and you need to take Action. This site provides the information and will guide you through your steps of action. 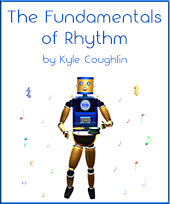 The information in this site is taken from my book, The Fundamentals of Rhythm. It is organized in a step-by-step manner so that each lesson builds upon the previous material. Each topic is presented in a clear and simple manner with examples. If you are studying the Fundamentals of Music or if you are a beginning student, start with the introduction and follow each lesson in order. The site is also useful for more advanced students who are looking for information or help with a specific topic, like syncopation or sixteenth notes. Learning about rhythm requires far more than just information, though -- it requires action, and this site includes the practice patterns from The Fundamentals of Rhythm to help you learn how to play rhythms by practicing. Each lesson focuses on one aspect of rhythm at a time with numerous examples that you can clap or play on your instrument. 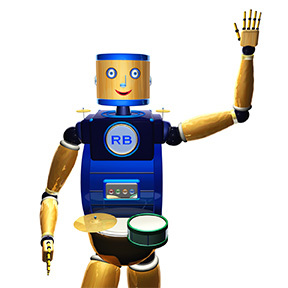 Each pattern includes an audio example played by RhythmBot, to ensure that you are performing accurately. If reading rhythms is new to you, make sure to begin with the introduction to rhythm so that you understand all of the basic terminology. 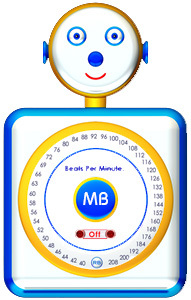 Once you have learned that info, begin with quarter note patterns to develop your rhythm and reading skills. If you are looking for another topic, you can jump to eighth notes, syncopations, sixteenth notes, or any rhythm topic that you need. Visit the Practice Tips page for suggestions on how to use this site effectively.